"Make a self watering can devise out of me"
But I can still hold plants well", says the battered pail. "Donot discard me as useless, Oh dear man! Sow seeds of joy in me" urges the disposed can! "Now make me a part of the Urban Leaves Club!" Use us judiciously and some amazing results you will see! To start off a kitchen garden, you dont really have to go out, buy expensive pots and containers. Have fun with your creativity, give a thought to reusing and recycling stuff around you and you will be surprised at what can be achieved! These can be made from recycled Bisleri 1 liter bottles or slightly larger jars. One end of the rope should come out from top and one end immersed in water. Fill up the upper part with good nutrient soil and plant saplings like Basil, Tulsi, ginger, garlic, mint …. Why are these bottles useful? Plants need moisture and not water. Most of the pests’ attacks on plants, even after using good soil are due to excess watering. When we put too much water it fills up all the air gaps in soil, making it difficult for microbes and soil organisms to breathe and they die. This affects the health of soil and plant as most nutrients from soil are made available to plants by microbes. Using self watering cans helps us in many ways. · It enables the plant to take in only as much moisture that it needs. · It helps conserve water, otherwise wasted due to over watering. Observe the difference between plants in regular pots and those in self watering cans. Draw your observations and share with friends! What can be planted in such bottles? Experiment with what you like and use in your food. like Basil, Tulsi, ginger, garlic, mint …. Old buckets are best for larger plant varieties like Brinjal, raddish. Spinach in a biscuit tin. You can also grow Pudina and Mint in it. grown again after harvesting leaves. 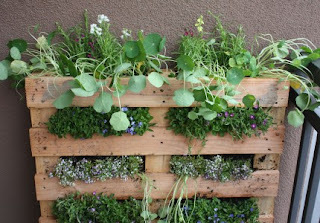 Read on about how to make a pallet garden HERE. There are always ways to learn and share. Not having place to garden is no more true. If one watches and observes in nature there are plants everywhere... in nooks and corners, in between rocks and bricks. So lets get started and green our surroundings!